The second day, we split into smaller groups; I went with a “blue” group (big tires and lift) and we went to explore the western part of the park. Here is a photo of the groups lining up to depart. I was busy driving and didn’t get a lot of pictures, but the trails went over a more conglomerate part of the park with broken boulders and sand between. This means we had different traction on each wheel, which is difficult without locking differentials. 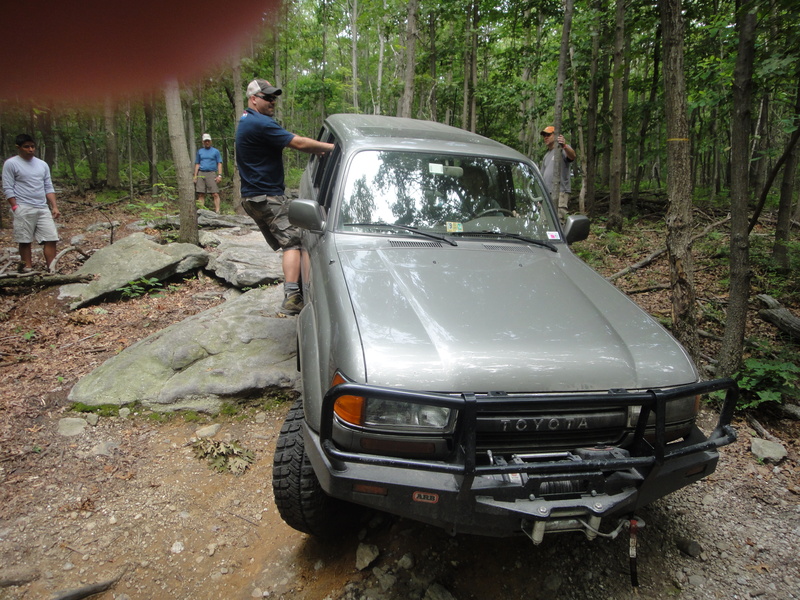 The photo above shows the smaller talus at mixed in with very large boulders as we climb up an old mining trail; however, we leave the trails and just drive over the rocks as best we can. The view from the top is great and worth the effort. 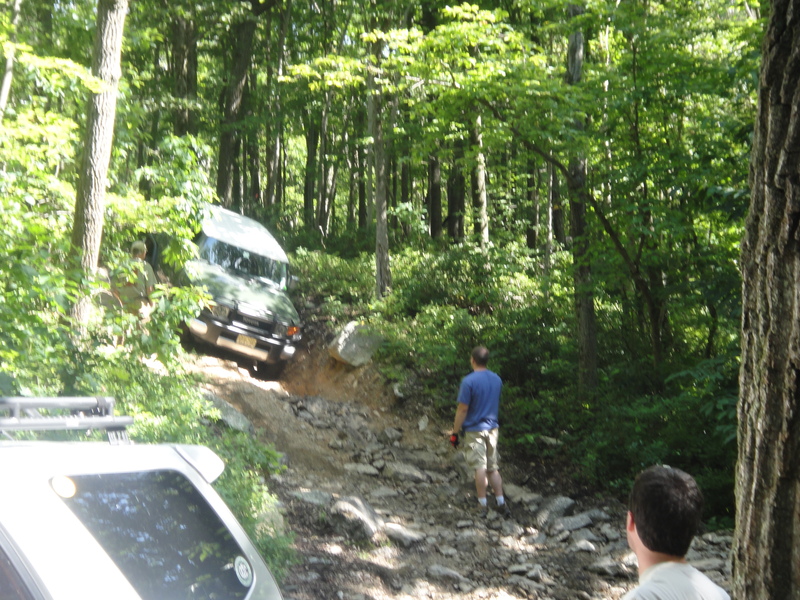 Then we drove down a very steep side of the ridge to a modern creek with real mud (thin) over the rock debris. Water and mud were everywhere, mixed in with boulders to clamber over. We finished the day with a difficult climb over medium (~2 foot) boulders strewn amongst tree stumps and sand, which was challenging. 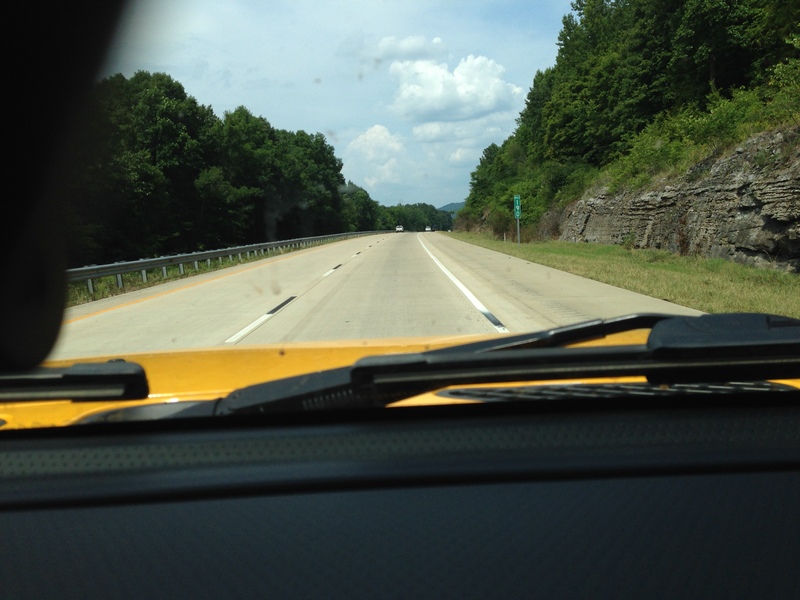 I was doing well without locking the rear differential and then…. My steering catastrophically failed (BANG…) and I was dead in the water. 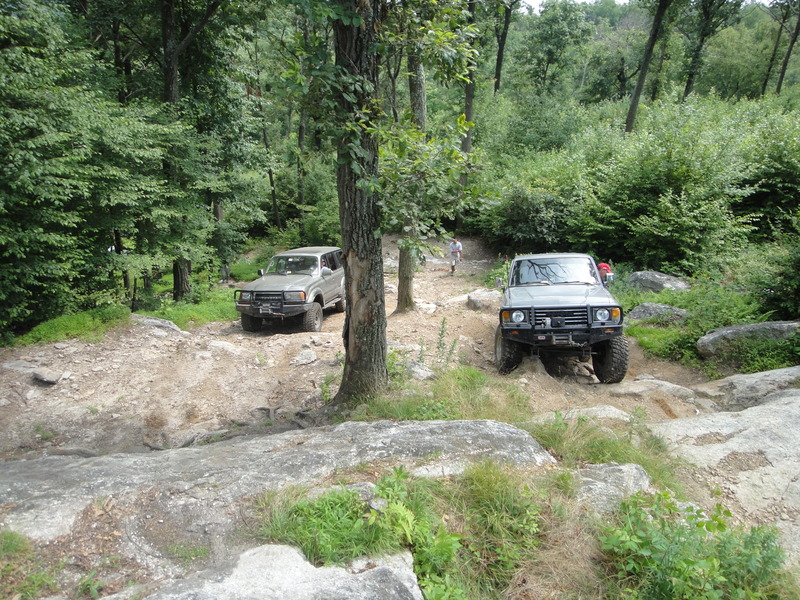 Rich and John (pres and vice-pres of the hosting club/ Gotham City Landcruisers) were there within 30 minutes. I was saved by Mark who had an alternator-driven arc welder. He took an hour (he was wheeling on the other side of the park). He welded the busted pieces back together on the trail (side of a mountain) and I was back to camp for dinner. 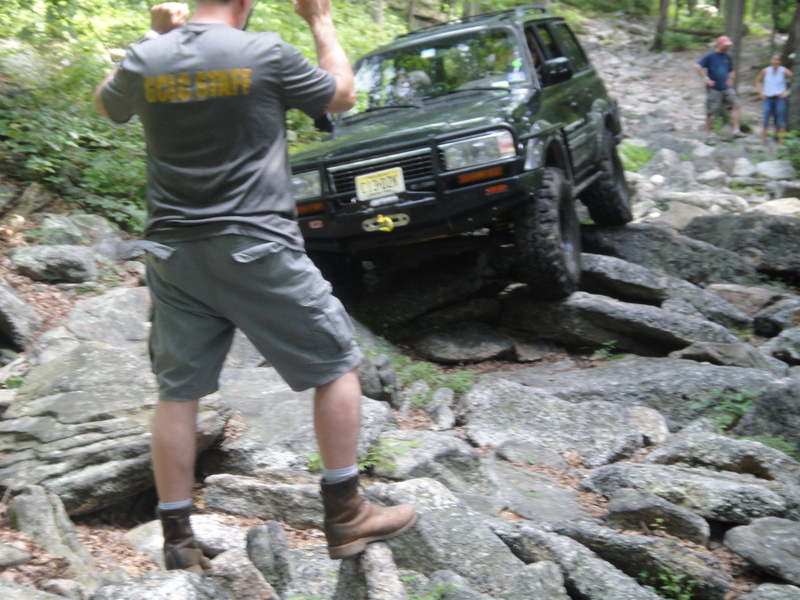 A few people were ready on the first day so we ran some trails in the Rausch Creek ORV Park that were mixed for stock/big tire trucks. This park is an abandoned coal mine, but there was not enough coal to remove the mountain, which is typical for higher grade Anthracite mines (remember this coal was formed during an orogeny). We drove through some holes that were not (usually) deep, if filled with water, and had a black color that is a dead giveaway for coal dust (not mud). These got as deep as 30 inches (the trail guides new the depths beforehand). 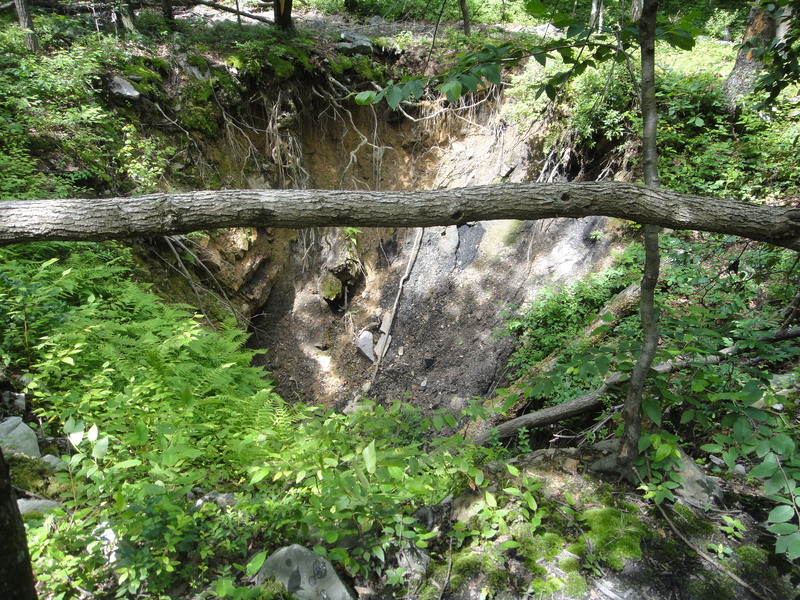 However, there were some very deep holes where the miners had gone looking for a economically viable coal seam. These were unmarked and you don’t want to drive into one. 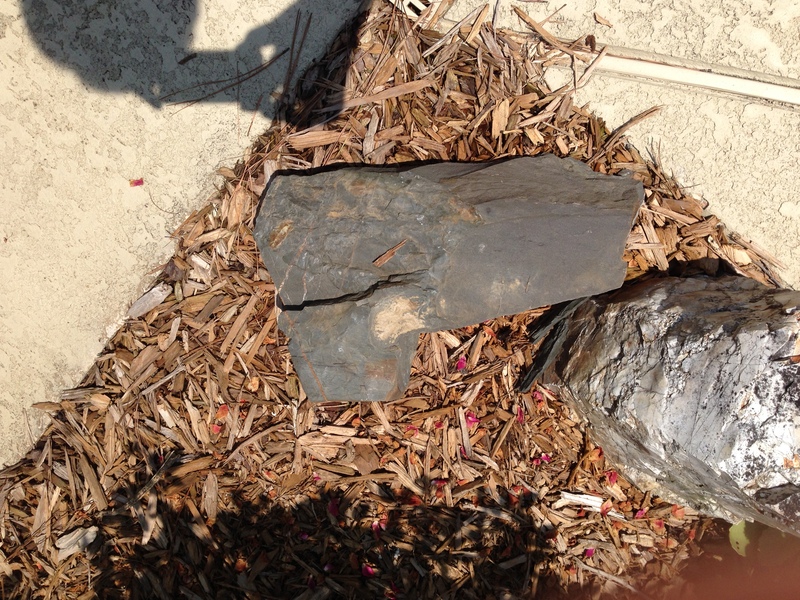 The Pottsville Groups has four main kinds of rock: coal, conglomerate, sandstone, and shale. 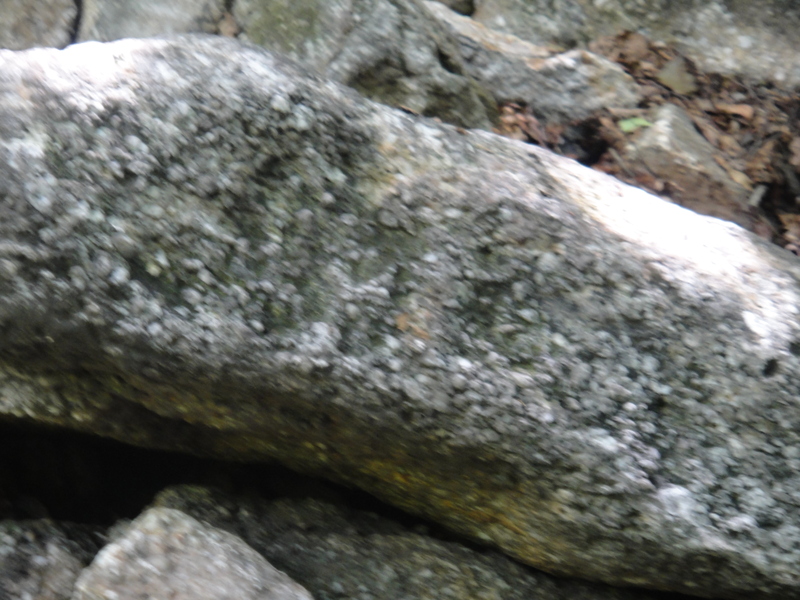 The conglomerate has large (~.25 -.5 inch) pebbles in a matrix of sand and cement (calcite or silica). This picture shows the texture of these rocks. 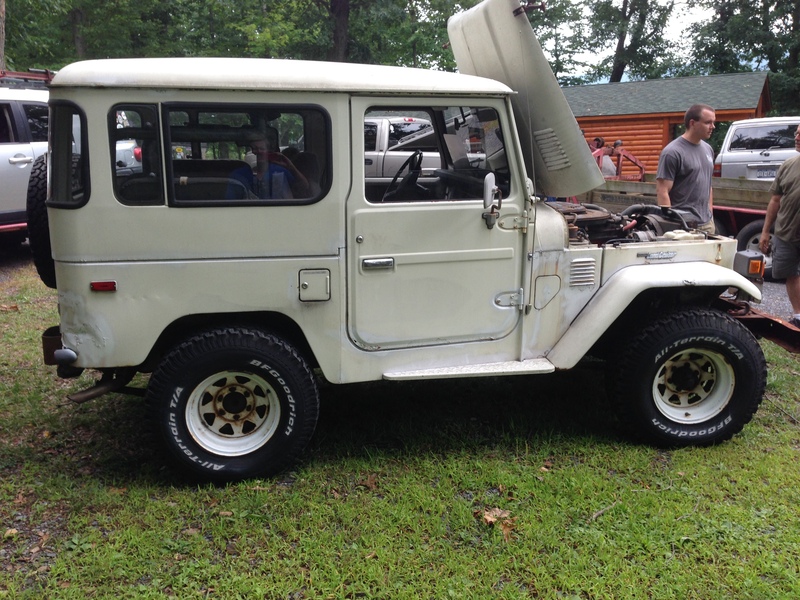 Because we were a mixed group of eager-beavers (you just want to go wheeling! 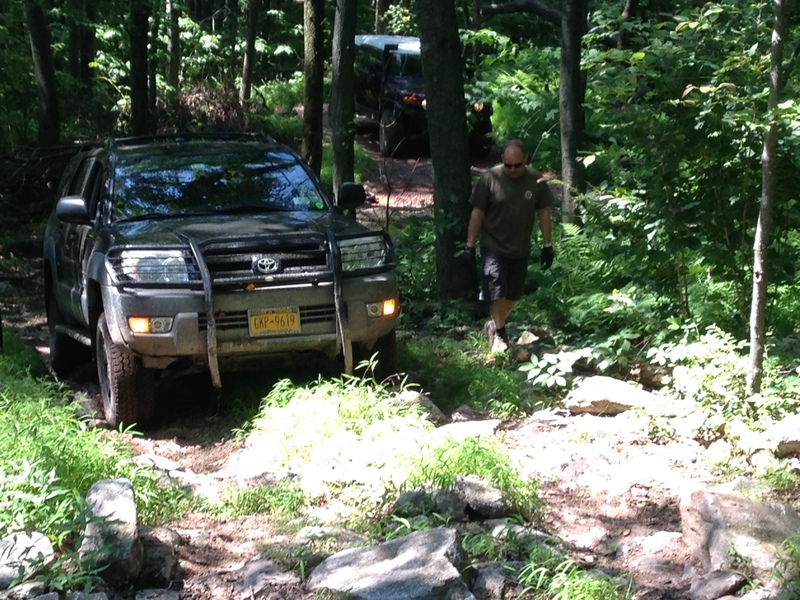 ), a couple of trucks took a detour to do some rock crawling. The guy in front is the spotter, who tells the driver where to steer. 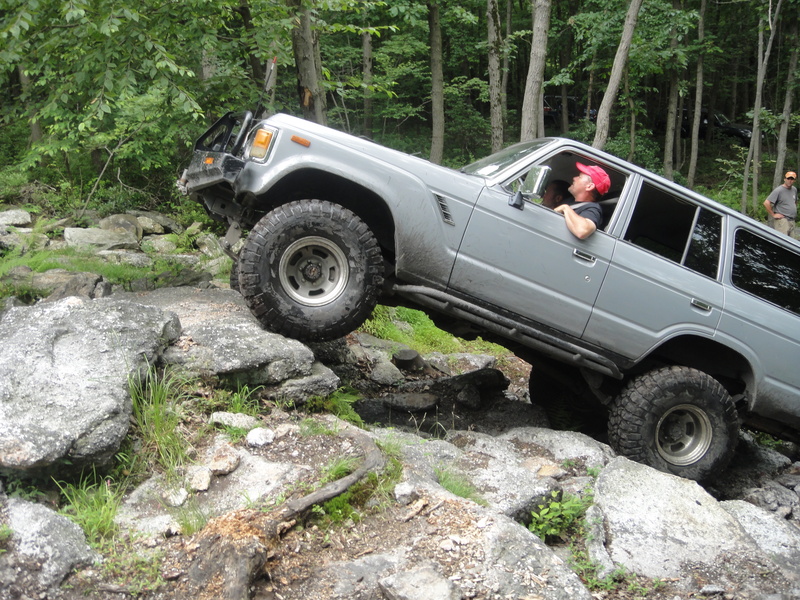 Eventually, the trail guide stepped it up a notch and we did some blue trails (bigger tires and lift), which freaked out the stock trucks, but they did fine with some help from expert spotters. 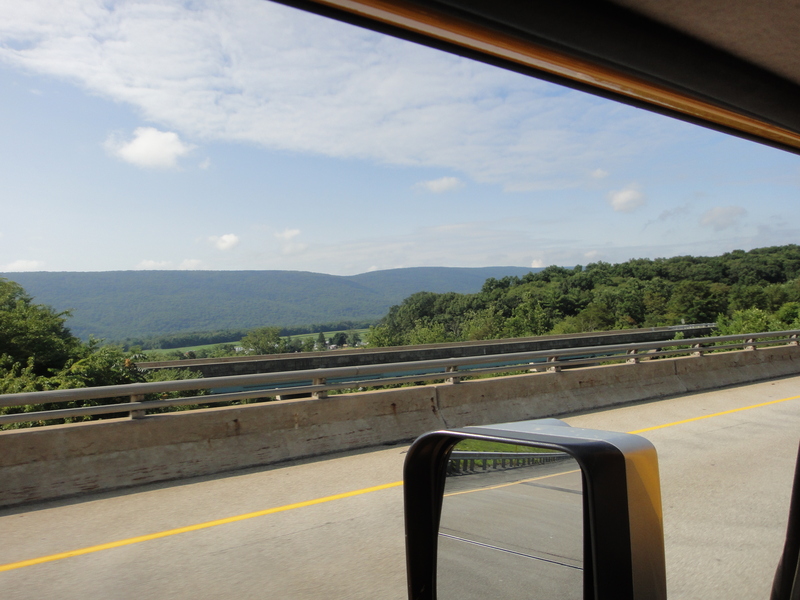 Today, I covered the southern Appalachians and drove along the axis of the famous Shenandoah Valley, which was settled in the 19th century. 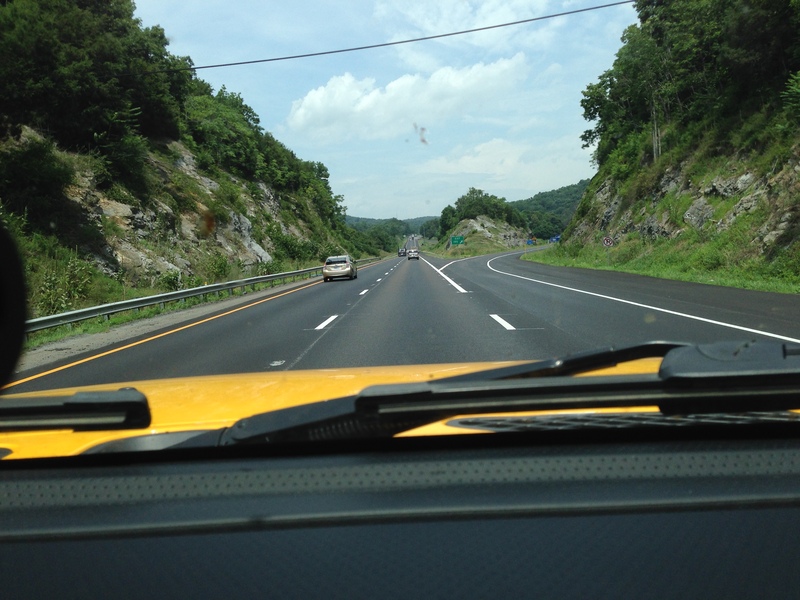 It is bounded by the Blue Ridge Mountains on the east and the Ridge and Valley mountains to the west. 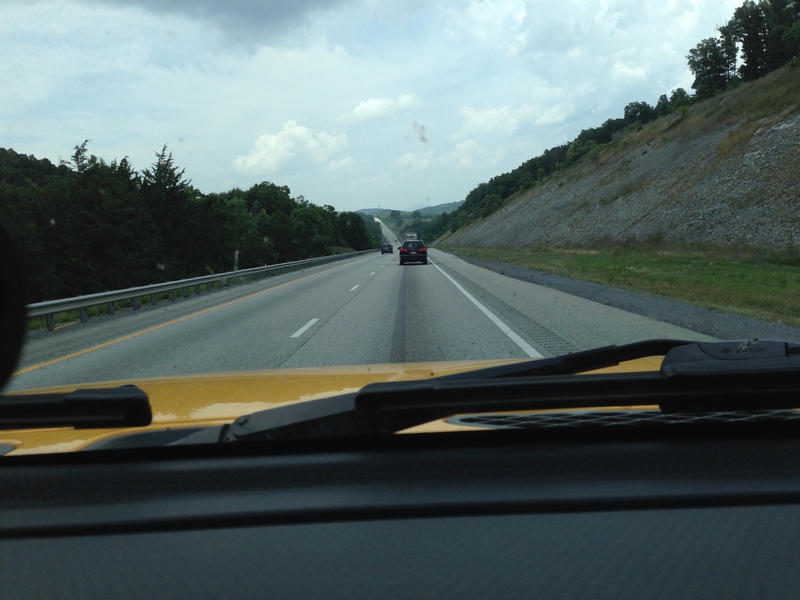 This is also the fast lane that General Lee used to drive the Union army crazy in the American Civil War. But before entering the Shenandoah, I had to drive up hill some more from my starting point in Chattanooga, TN (black square on the map) and cross a complex geologic province that includes the Roanoke Valley, which follows the Roanoke River in a general east-west direction. 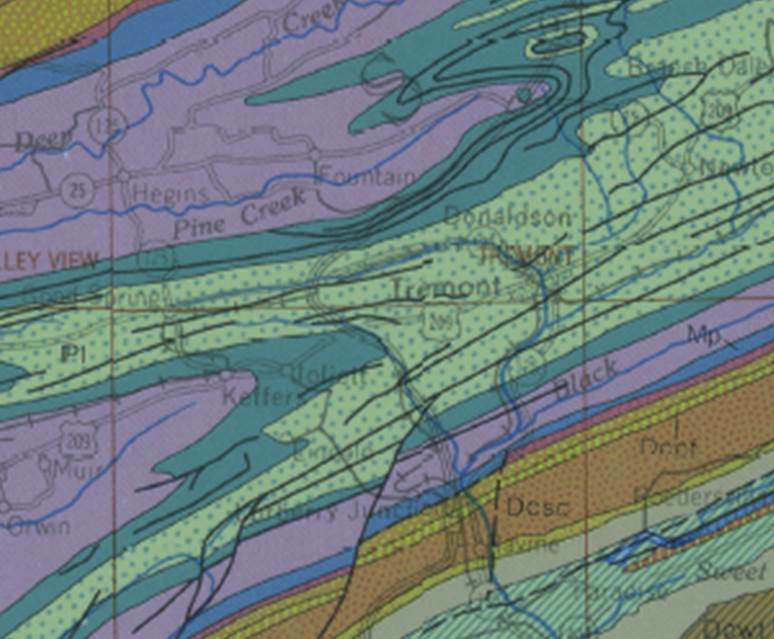 In other words, it cuts across the trend seen in the contours of this excellent Appalachian geologic map by Crop and Hibbard. The circle is where I am staying tonight, Martinsburg, West Virginia. The black line is my approximate route up the southern Appalachian Mountains. I must make a short interlude on Paleozoic limestones. There is no good single reference on this phenomenon but most of the eastern U.S. was covered by seas of varying depths between 500 and 250 million years ago (rough approximation). Sea animals like shrimp, oyesters, etc., lived in them as they do today and when they died, their shells settled. This went on for millions of years and eventually these shells were buried along with any sand/silt/clay that may have been brought into these seas from the eroding land (much like the plumes we see in modern rivers like the Amazon). These accumulation of shells and land-derived sediment were transformed into limestone over millions of years and deep burial (like 10 miles). 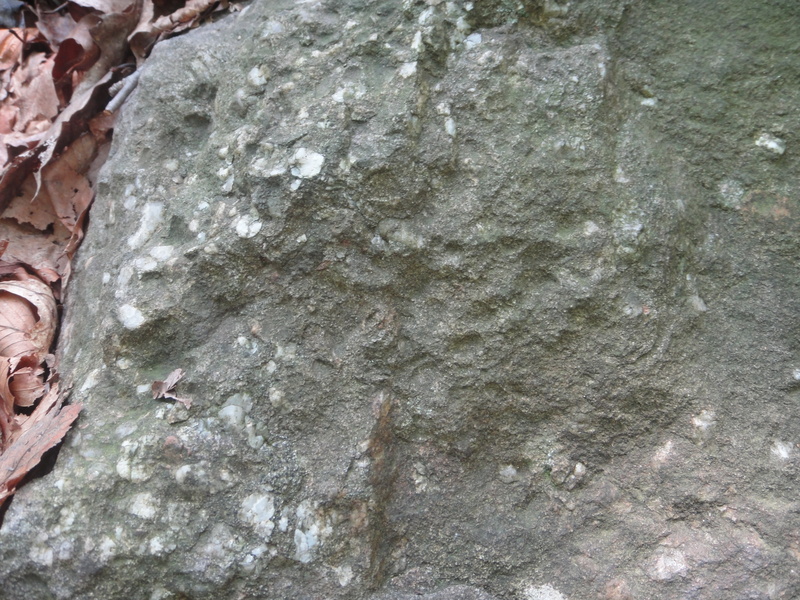 The primary rock I saw on this day’s journey was Paleozoic limestone. 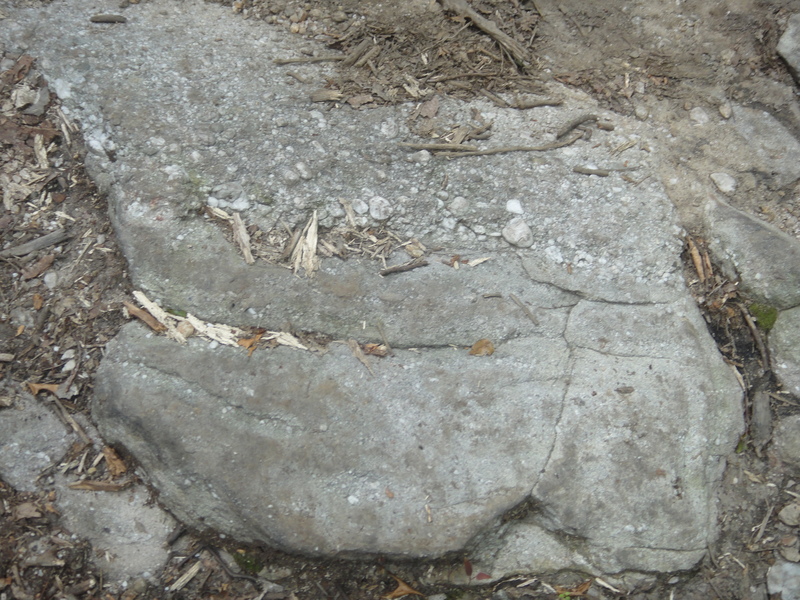 These rocks were deformed when the great continental collisions of the later Paleozoic occurred, like the Appalachian Orogeny. I saw these limestones as I passed Birmingham yesterday but now we seen them more deformed by folding and faulting during the Appalahcian Orogeny. This image shows them near the Roanoke Valley, where they are tilted in a southerly direction. As I travelled northward and crossed several ridges I found these same (kinds of) rock were almost vertical or tilting to the east. This is within the Shenandoah Valley. 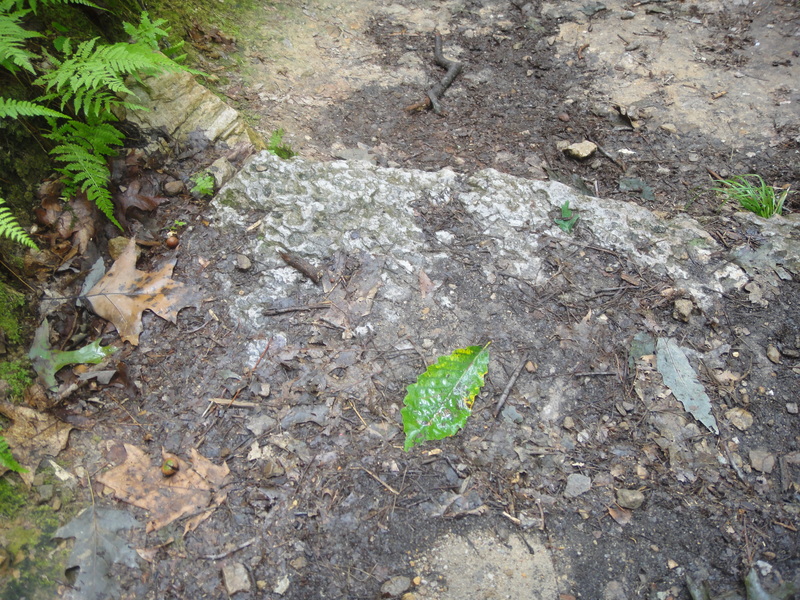 They also varied from thin to thick bedded (obvious lines in the rocks are called bedding). I couldn’t get a picture of these but they were impressive over 10’s of miles. 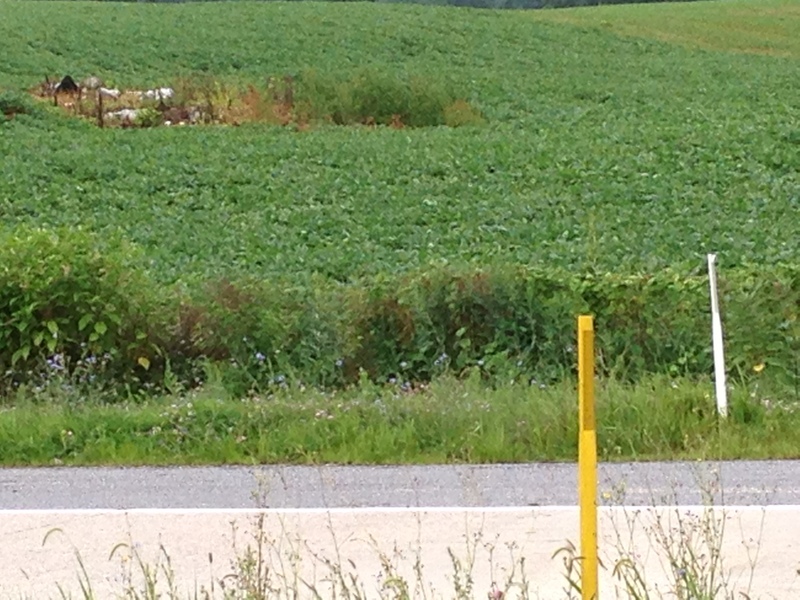 I also saw some thin (<3 feet thick) beds of shale (mud stone), which indicates contamination by land-derived sediment. 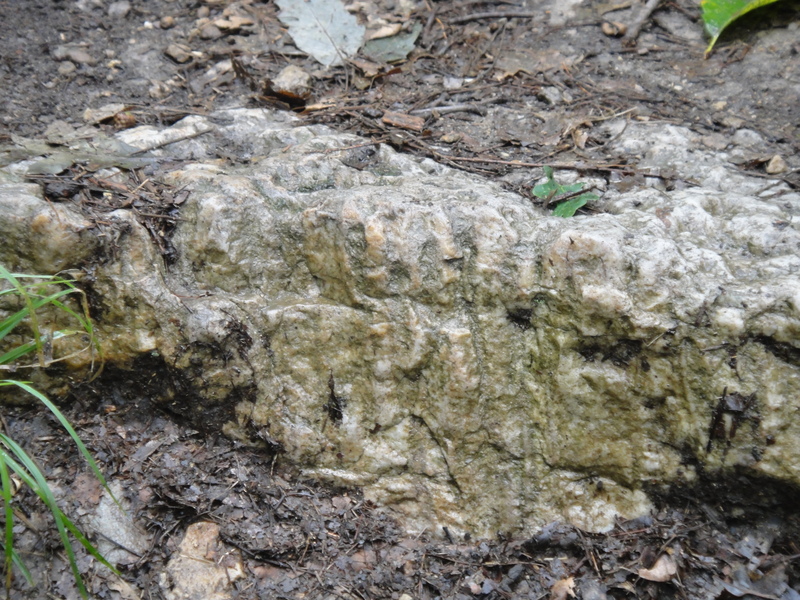 This makes the limestone less pure and can contribute to poor strength, as well as breakage by faults. The result of these processes (and others I am not discussing) leads to road cuts like these. These were more common in the southern part of my drive (see path above). 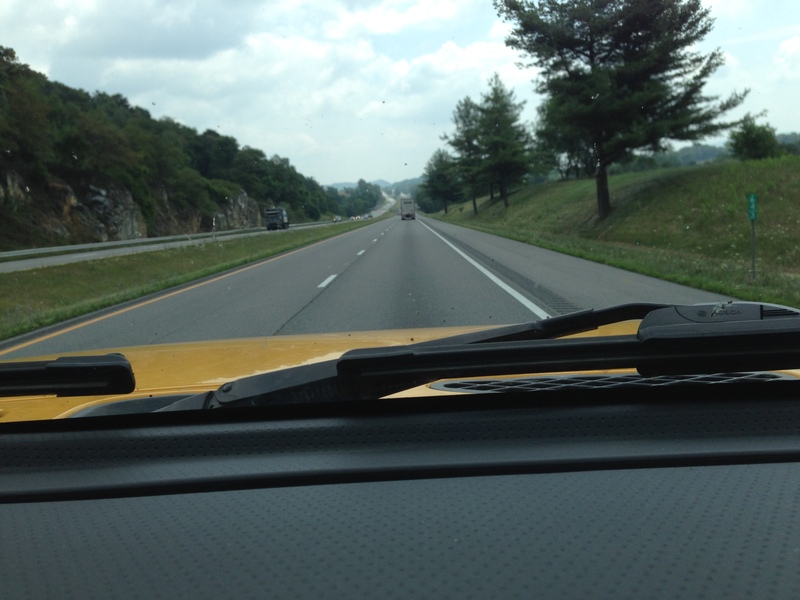 When I drove further north, however, the limestone was very strong and supported multiple road cuts for north and southbound lanes. I wanted to stop and examine these exposures up close but my schedule didn’t allow it. Next time I will plan accordingly and do a better job of correlating my photos to the geologic and topographic maps (still not easy to do with an IPhone). One last note (of many I would like to make) is that I saw no more pine trees; I have left the pine woods of the coastal plane behind. This is the beautiful world of the temperate deciduous forest (this time of year)! 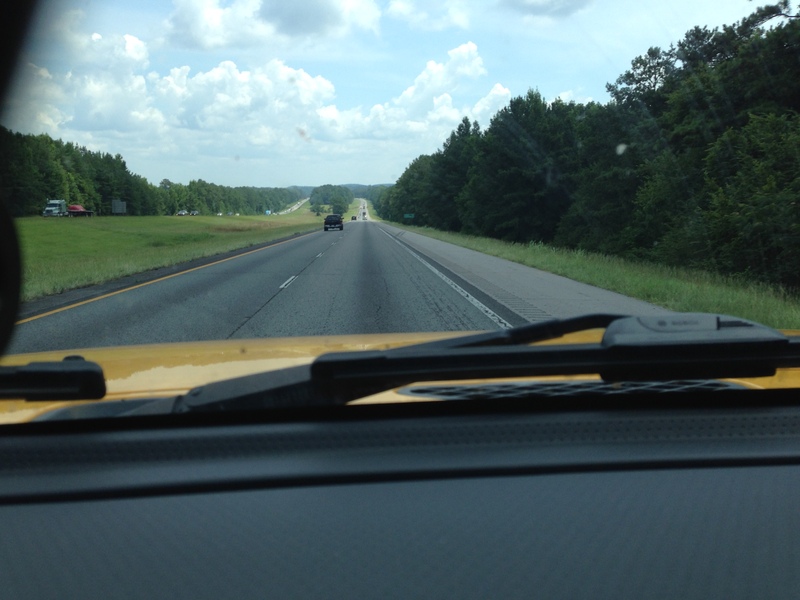 Today I drove 450 miles and slowly climbed from the flat, pine-dominate, coastal plain province onto the gently rolling hills of central Mississippi and Alabama, which are a transition to the Appalachian Highlands, which are identified by the long hills coming into and immediately north of Birmingham, AL. This photo shows the features of this transition area. These are the terrace and braided stream deposits we saw at Sicily Island, Louisiana previously. They look like stream gravel. 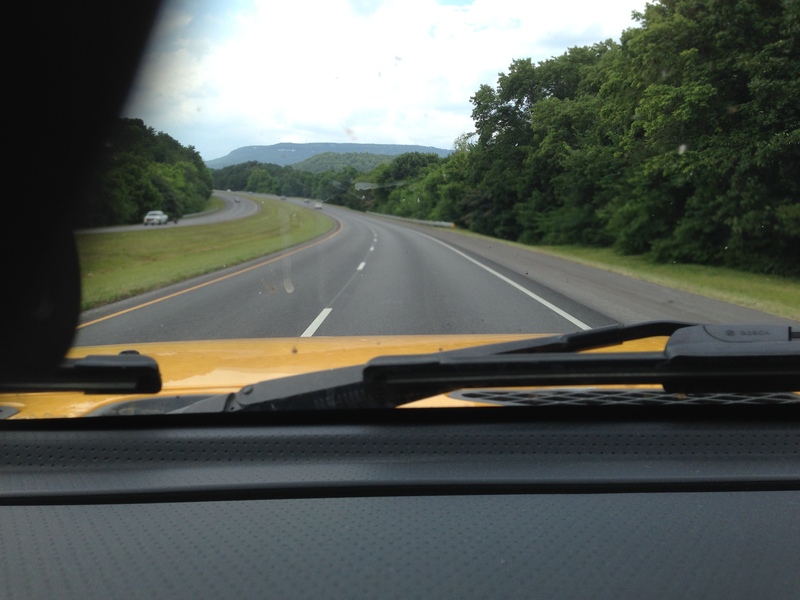 This blog isn’t summarizing the geology of the areas as we drive through them, but the region around Birmingham is a Paleozoic basin with sandstone, limestone, and shales that has actually been a major source of iron ore (from the limestone. ); this means, rocks. 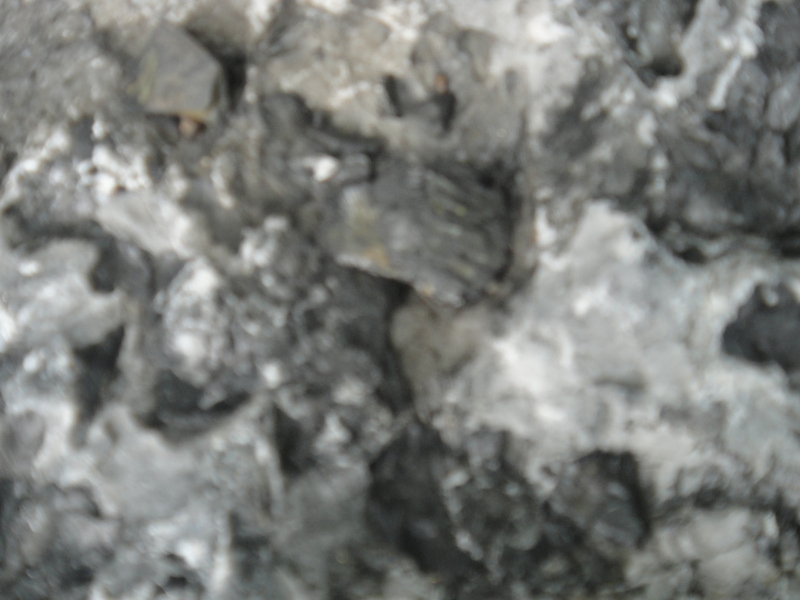 The next couple of images show how these limestones vary from thick bedded to very thin bedded (they even contain coal). The causes of the variations in bedding are not exactly known buy thick beds are interpreted to be deeper water with no contamination by sand and/or shale. 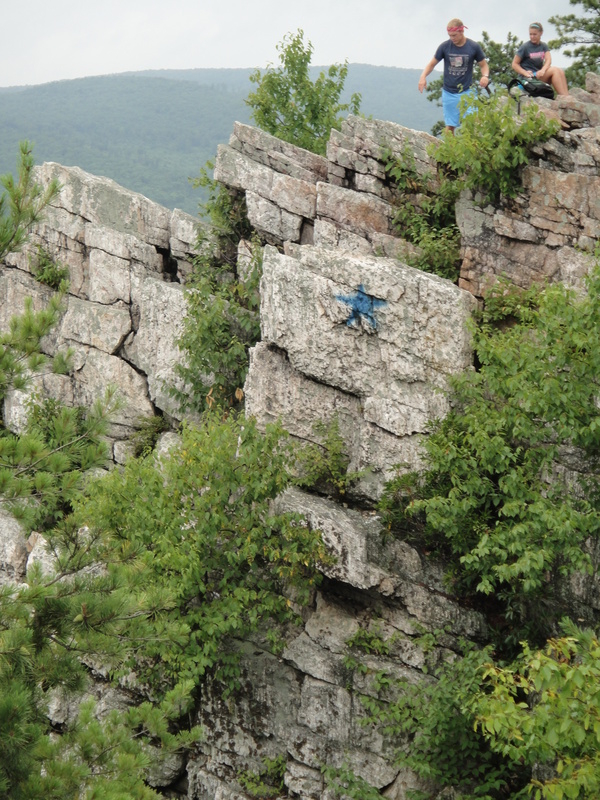 The following image shows where the road cut had to be sloped because the rock was not solid enough to form a cliff. After I cross the state line into Georgia, however, these rocks become massive (i.e. little bedding visible) and form Table Mtn. We are further from the coastline (in Paleozoic time) and the limestone is pure; dirt screws up the lithification process (rock forming). 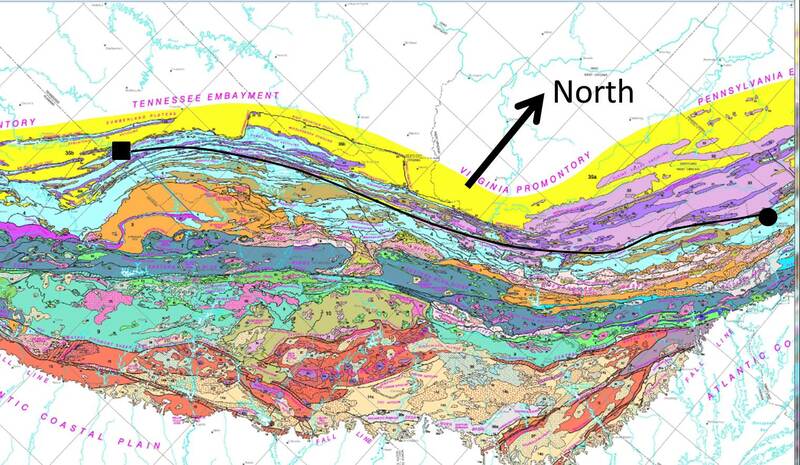 This traverse is seen in a geologic map of MS-AL. The overlapping terraces cover the underlying linear structure that was formed when these rocks were folded during the Appalachian Orogeny (~325-260 million years). For reference, today I drove from the southwest (lower-left) to northeast (upper-right) of this map. This is the first real-time post on this site and I am working out the kinks. This post is going to cover the preparation for the trip and the ride up, which takes a couple of days. Before embarking, I need to do some background work to understand where I am going. 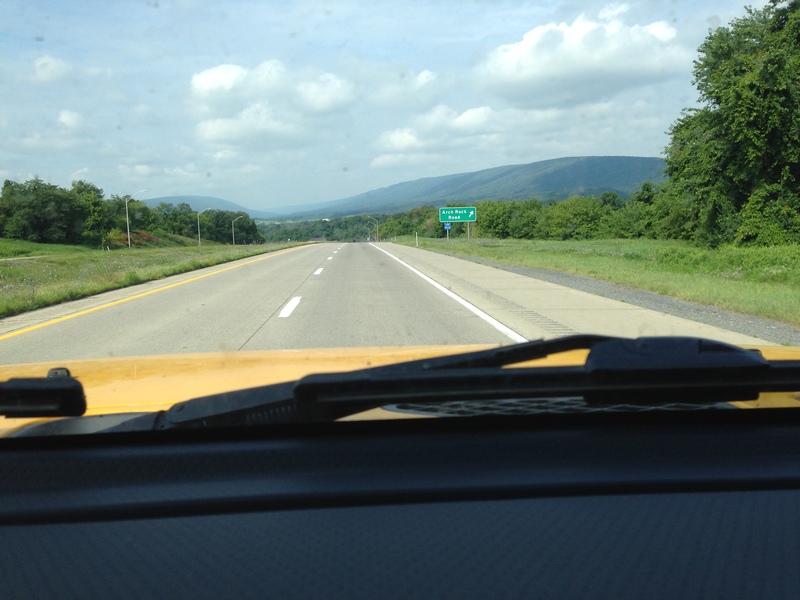 The rest of the posts on this trip will refer to this post, which introduces the geology of eastern Pennsylvania. This image shows the trip route going (blue) and returning (gray). 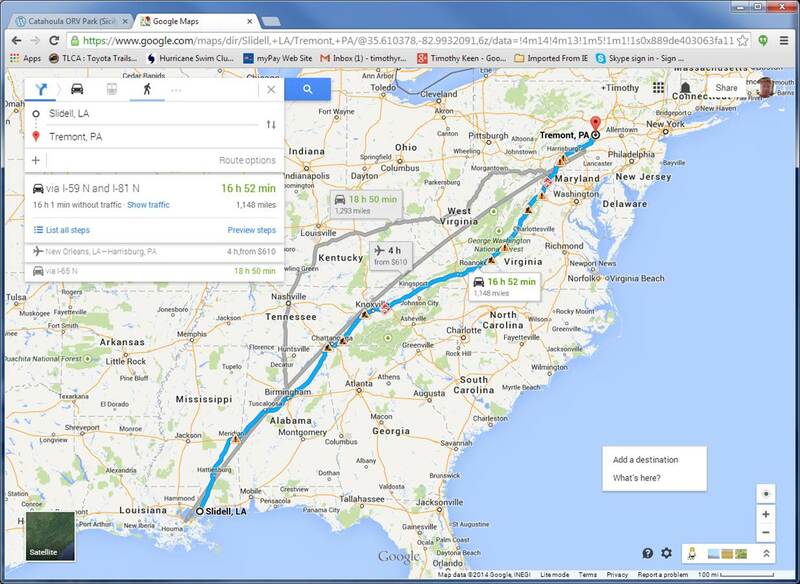 The aircraft route is shown for reference, but I couldn’t afford to fly my 5000 lb truck so I have to drive. 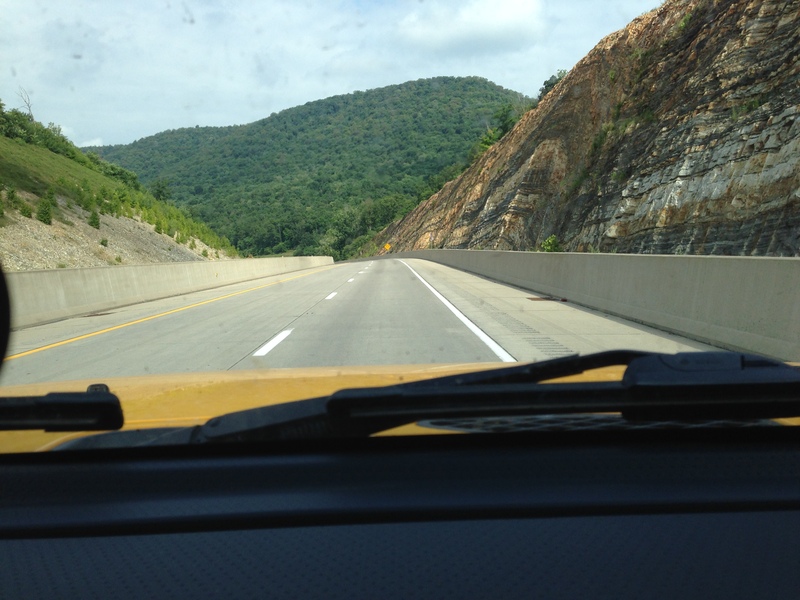 As an overview, the eastern route follows the natural geography of the Appalachian Mtns after we get to Chattanooga. I will talk about this more later, but these are the roots of an ancient (~400 million year) mountain range when America collided with Europe. The destination is at Tremont, PA (marked on map). As with previous excursions, we have to zoom in real close to see the tiny areas we are operating in. 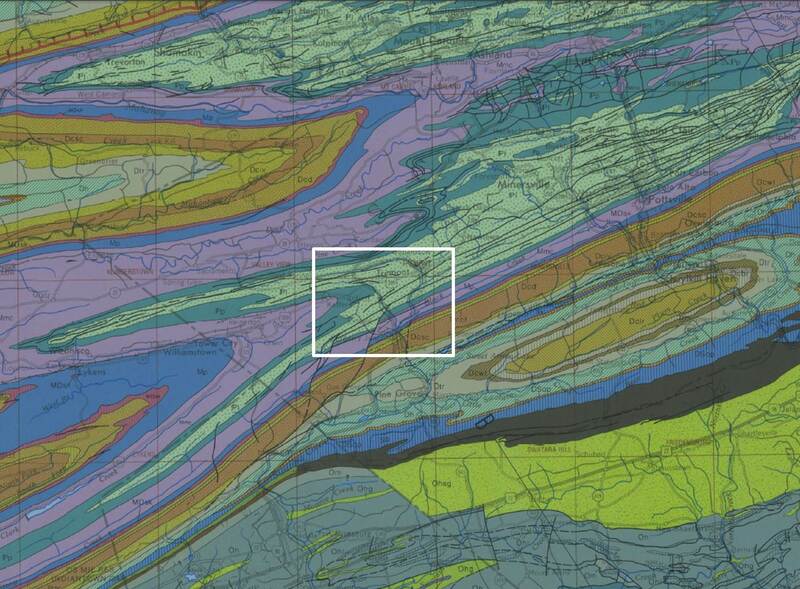 The following image from the official PA geologic map shows the area in a rectangle. 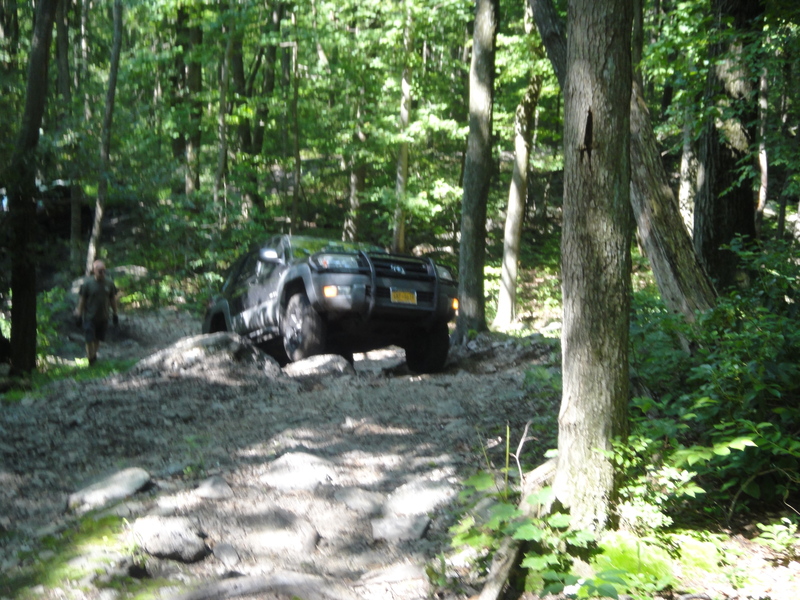 This is much larger than Rausch Creek ORV Park but it shows us that we are going to be off road in the Pennsylvanian Period of the past (~350-300 my). The tan-colored area is the Llewellyn Formation, which consists of sandstones at the bottom of sequences that are probably cyclothems, which represent alternating increases and decrases in local sea level. 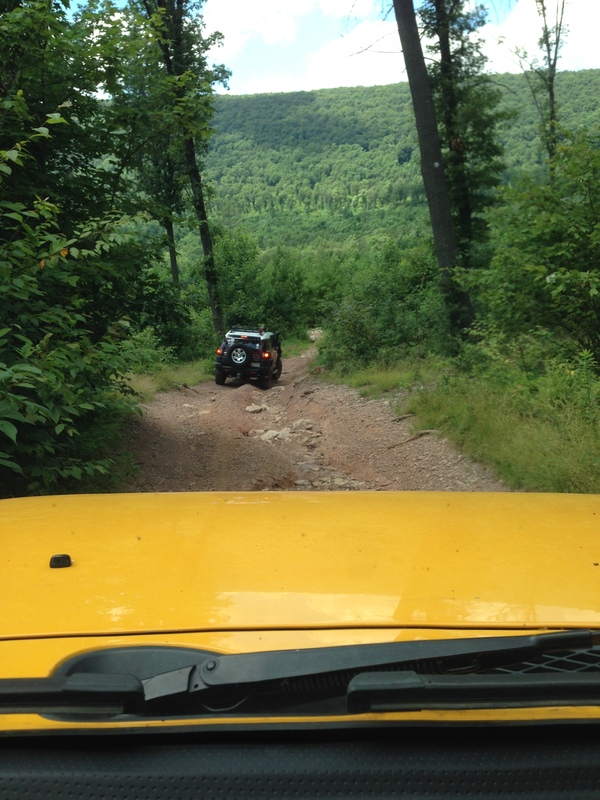 These rocks include coal seams, as reported by the Rausch Creek ORV management, i.e., they warn drivers they may drive into an open pit if unwary! Here is a close-up of the area. I will try and get good exposures (no problem on a rock-crawling trip!) to verify the rock types. 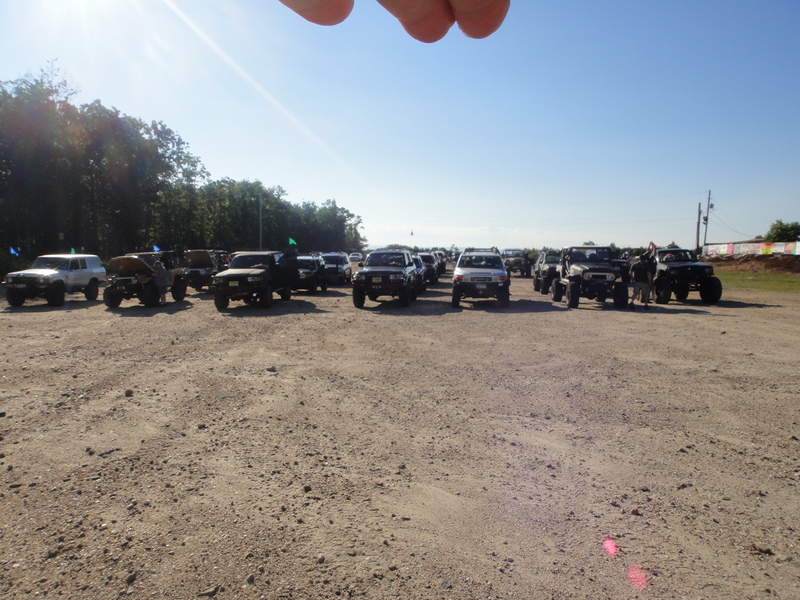 It is going to rain before the event so we will see if it is like Catahoula ORV Park! The final point I want to make is the preparation for the trip. I used Google Map to find the area and checked Google Earth to see what the area looked like (so forested that the trails are not visible), and then checked for geologic maps. The last point yields many sources and there was a lot of work to focus on Tremont. I am not going to use satellite images (Google Earth) because of the number of trees! 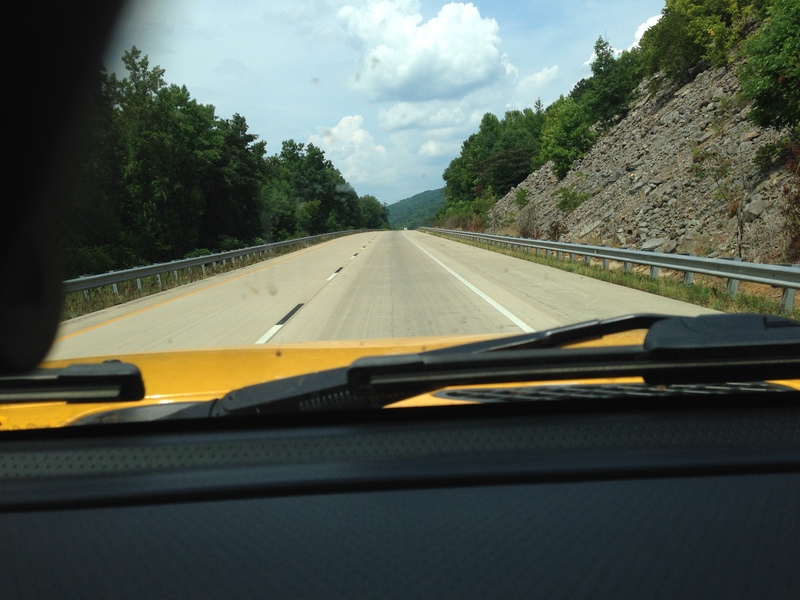 I will be referring to the Roadside Geology of Pennsylvania (B. B. van Diver, Mtn. Press Publ., Missoula, Montana, 1990) when I get to PA.